Rudy is a published author and an instructor of meditation. He studied meditation and esoteric arts from a young age and continued his curiosity of existence to today. His books include "The Emptiness is not Empty" and "The Books of the Kuro-Miko." His meditation classes are offered in his home studio in Iwakura, Kyoto. 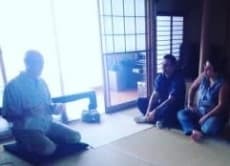 An introduction and experience of an ancient meditation technique in a quiet northern suburb of Kyoto.